Age of Sigmar is great in the way that it lets you start out small and build your force up as you go. Every size of the game is fun to play and feels like a complete game in a way that 8th Edition or even 40k doesn't. This makes it super easy to spontaneously start a new army without any pressure of having to drop a lot of money at once, which is exactly what I did. Back in 8th Edition Warhammer the standard game size was 2,000 points, and at the lowest people usually played 1,500 points. Lower then that and it didn't really feel like a complete game due to the mechanics and size of the units. 40k somewhat suffers from the same problem, which is why they came out with Kill Team. In Age of Sigmar that issue is really non-existent. From the get go it was advertised on how you and your friend could both just buy one box of models and play a game with them right there and then. 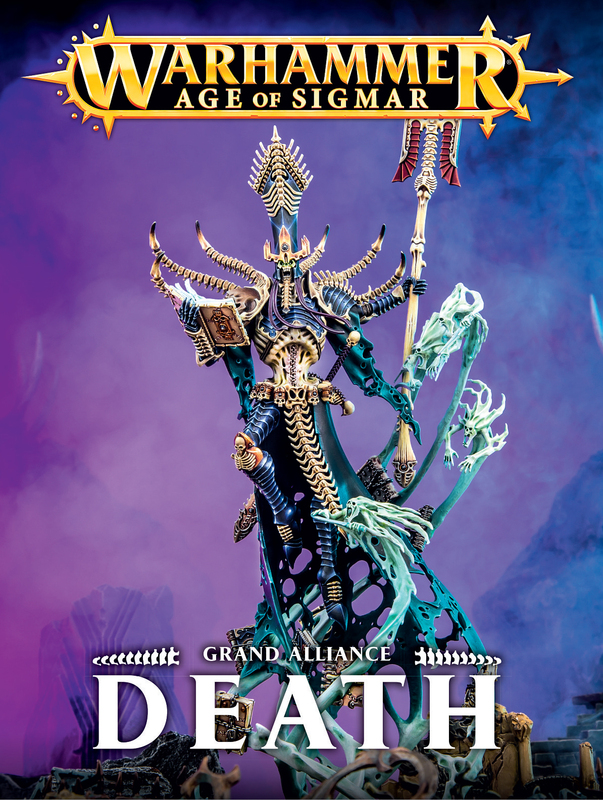 Alongside this you have how open the armies are, with Grand Alliances allowing you to basically mix and match a ton of units, and the fact that all of the rules are free online allowing you to really research armies before you start them. All of this combined makes it really easy to just decide to start a new army without committing a huge chunk of time and money into it. 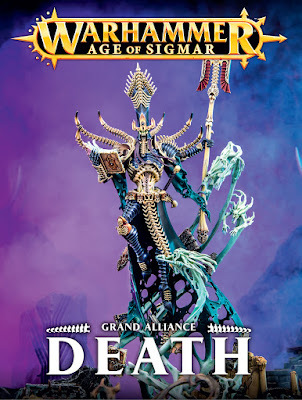 Right now for AoS I have my Tomb King army, which is probably close to 3,000 points of painted stuff, and my Stormcast Eternals, whom I am trying to paint to a very high standard. Both of these armies are taking a bit more time and effort from me, and I'm even now still painting new stuff for my Tomb Kings. With Adepticon coming up this year I decided to enter into the Team Tournament as well as the Singles Tournament. 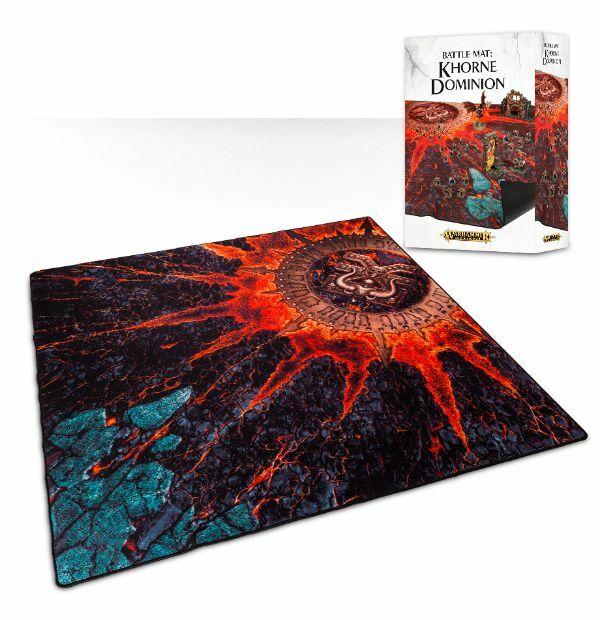 I will be taking my Tomb Kings with me for the Singles Tournament, but for the Team Tournament I only need a 1,000 point force, and it doesn't even have to be the same Grand Alliance as my partner. I saw this as the perfect time to start a new army! After going back and forth between Ironjawz, Bonesplitterz, and Nighthaunts I finally settled on Nighthaunts. I didn't just randomly pick this though. I read the warscrolls, and in some cases Battletomes, on all of these and built potential lists on Scrollbuilder. I then priced everything out to see how much each army would cost me, and they all ended up being within about $20 of each other, so not a huge deciding factor there. I had a spare 'Ardboy model lying around, so I decided to paint him up and see if I enjoyed it. I was also looking for something that wouldn't take a long time to paint, but still look good. This meant trying out a bunch of techniques that "cut corners" but still looked effective. 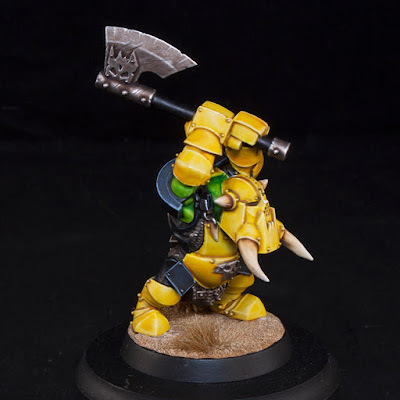 I was really happy with how my Ironjawz mini turned out, but it did take a bit longer then I would have liked for this project. 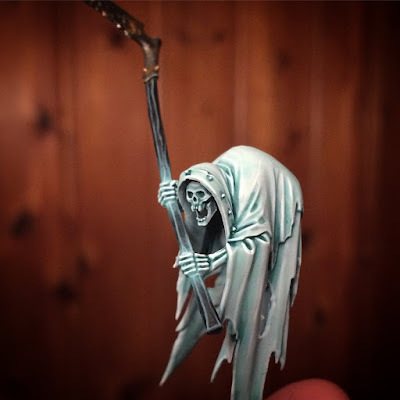 Next I went to my local GW and picked up a Cairn Wraith to test out a scheme for my Nighthaunts. This one ended up being super quick and looks great. After a bit more back and forth I decided to go with the Nighthaunts, and as I type this I'm waiting on all my stuff to arrive so I can start painting it. 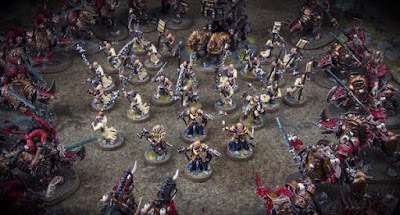 Now that I have this army incoming I'm really liking the idea of trying to get some sort of local Vanguard Tournament going where everyone just has 1,000 points, or a Vanguard sized force. This should allow for faster games, more games, and most importantly, more people to participate since the barrier to entry will be lower. 1,000 point armies are the perfect goal for hobbyists and are fairly easy to expand off of into a full fledged 2,000 point army from there. I'm already thinking about how I would expand my Nighthaunts if I enjoy painting them enough. If you're running an event it would be fairly reasonable to require fully painted armies at this point level too since it shouldn't take as long to paint up. 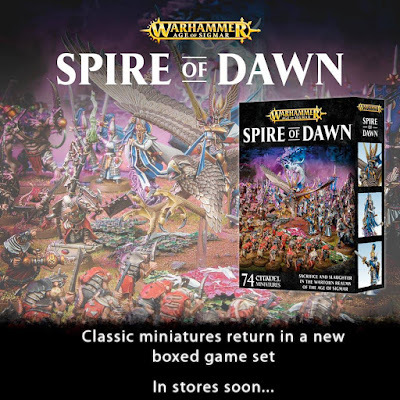 Games Workshop itself makes it really easy to start a new smaller army like this with the Start Collecting boxes and more recently the Battleforce boxes. The armies from the AoS starter set amount to about 700 points a piece too which are fairly easy to expand up to 1,000. They even have a new boxset coming out soon called the Spire of Dawn which looks to be a rerelease of the Island of Blood set. Split this with a friend and you are both really close to having a Vanguard size force already. Vanguard games are perfect for when you don't have as much time, or you want to get more games in. They also take up less space, using only a 4' x 4' area instead of the normal 4' x 6'. While I'm not going to stop playing 2,000 point games anytime soon, the allure to quickly start and finish an army and be able to play games that feel complete is huge. Instead of having one or two super large armies I could easily see myself having a handful of Vanguard sized armies. This allows me to try out new things, vary up what I'm painting, and prevents you from getting burned out on one army. You could even start a Vanguard army as an add on to your existing army if they are both within the same Grand Alliance. Vanguard armies also let you really commit to a theme. When you don't have a ton of models to build and paint it's easier to do a bunch of conversions or make something super themey. The way everything has been broken down into smaller factions really supports this idea too. While some factions may seem like they don't have enough unit variety for a larger army without having a bunch of repetition, a smaller army doesn't suffer that same issue. I would love to see a Scourge Privateer Vanguard army, or an Order Draconis Vanguard force. They would look awesome, and completely support their own theme. From there you could leave them as is, really commit to the theme and build it up with only units from that faction, or expand out into other factions in your Grand Alliance. 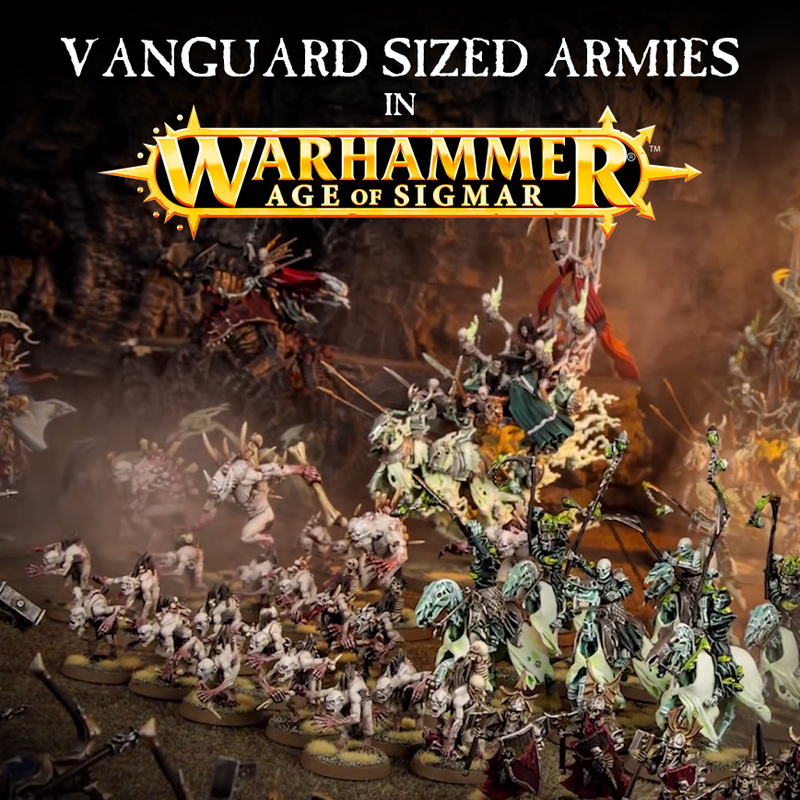 Build two Vanguard armies from different factions within the same Grand Alliance and now you essentially have three different armies! Two 1,000 point armies and one 2,000 point Grand Alliance army. It's also a good sized force for Armies on Parade, which is always fun to enter each year. 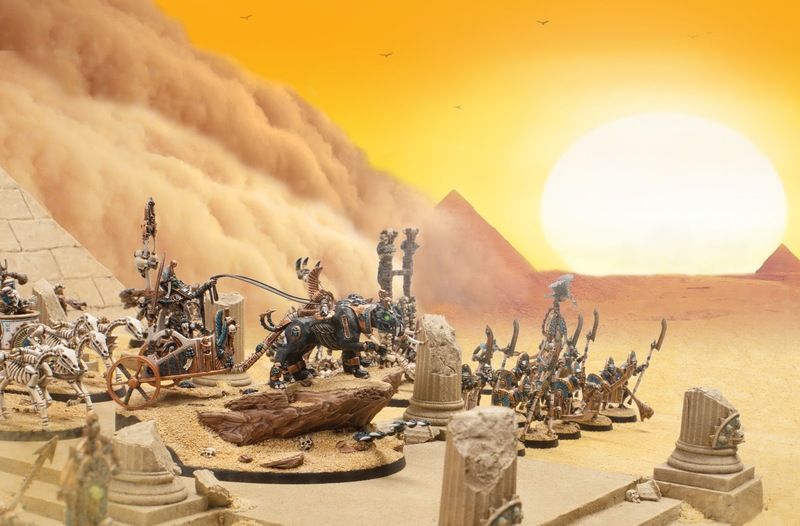 What are your thoughts on Vanguard sized armies and games? Does it appeal to you or are they too small? Let me know in the comments below.